Returns are definitely one of the key influencers of investment decisions. However, poor governance can result in failures, as too much emphasis on returns may result in ignoring the need to understand and manage the potential risk. It is important to understand the risks associated with an investment strategy. Risk can have different interpretations depending on the situation; it could be seen as an opportunity for one and an avoidable situation for another. Many portfolio strategies target the dual objective of growth and prevention of loss of capital. Hence, it is imperative to adopt superior risk management processes. Assessing the risks associated with portfolio strategies or investment decisions has multiple benefits. Risk can be quantitative or qualitative in nature, and assessing the different types can help manage volatility or limit downside potential. A well-defined risk management approach is beneficial during market turbulence, when impulsive decisions can lead to losses and overlooking the scope of long-term wealth restoration or creation. There are various tools that are used for risk management, such as diversification, balanced asset allocation, and monitoring of the goals and the portfolio. Diversification is not considered a guarantee or a perfect solution, but rather it is a tool to manage risk and reward by choosing a mix of assets to help spread the risk, compared with a concentrated strategy that can be overweight in certain asset classes or sectors. Passive, or index-based, investing can be a great way to diversify a portfolio or strategy. Indices can be used to represent an asset class in the asset allocation process, and historical index data helps in probability analyses. 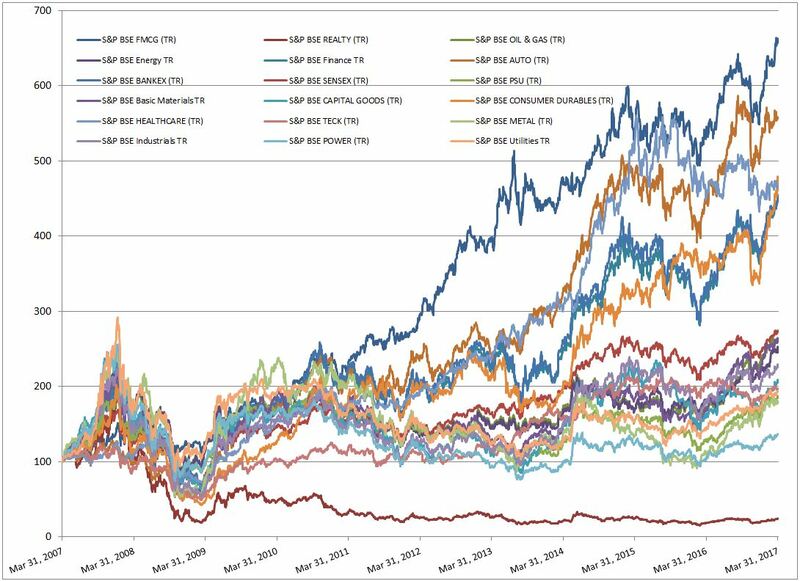 To demonstrate diversification via sectors, we can view the various sectors of the S&P BSE Indices that display trends over the past 10 years. The S&P BSE SENSEX, a well-diversified market benchmark, is designed to measure 30 stocks that represent all 10 key economic sectors in India. This is where we can observe a diversified strategy. There are sectors that have outperformed the diversified S&P BSE SENSEX, but some sectors have underperformed. A historical analysis helps to identify the underperforming sectors, but when portfolio management strategies are constructed, we cannot know what certain sectors, regions, or strategies may outperform in the future. Therefore, diversification can be a useful tool to help balance a strategy. Strategies that bear investment and longevity risk because they hold funds for a longer amount of time may need to adopt sound risk management practices in order to obtain better protection against potential risk. Source: Asia Index Private Limited. Data from March 2007 to March 2017. Past performance is no guarantee of future results. Chart is provided for illustrative purposes. Source: Asia Index Private Limited. Data as on 31 March 2017. Past performance is no guarantee of future results. Table is provided for illustrative purposes. Note: The S&P BSE Indices sectors are based on the BSE sector classification.